As I pointed out in my new book The Power of Music: God's Call to Change the World One Song at a Time, some of her songs address subjects like the shooting of Trayvon Martin ("Angel Down") and Hollywood's obsession with women's looks and sexuality ("The Fame"). Most notably, her song "Born This Way," which set the record for the quickest song to reach one million downloads, contained a very personal message: "I want to write my this-is-who-the-f--k-I-am anthem, but I don't want it to be hidden in poetic wizardry and metaphors. I want it to be an attack, an assault on the issue because I think, especially in today's music, everything gets kind of washy sometimes and the message gets hidden in the lyrical play." Lady Gaga was shouting from the rooftops: "God makes no mistakes." That's how you were born, and you should take pride in that fact. That's why her powerful rendition of the Star Spangled Banner at Super Bowl 50 was considered to be a great victory for the LGBT community. She was their spokeswoman, a voice for the oppressed and the marginalized. As one headline proclaimed, "Lady Gaga's Fabulous, Super Gay Super Bowl National Anthem. Campy, theatrical, and queer-as-h-ll, Lady Gaga's super gay, super patriotic 'Star-Spangled Banner' at the Super Bowl is a sign of the times. Of changing, acceptant times." In that same spirit, Gaga also wrote the song "Americano" against the backdrop of California's Proposition 8 in 2012 (the battle over gay "marriage"). As she explained (and as I cite in my book), "I am singing about immigration law and gay marriage and all sorts of things that have to do with disenfranchised communities in America." Now, in 2019, Lady Gaga has spoken out once again, this time at a concert in Las Vegas. Before her adoring fans she said, "To Mike Pence, who thinks that it's acceptable that his wife works at a school that bans LGBTQ, you're wrong. You're the worst representation of what it means to be a Christian." She continued, "I am a Christian woman, and what I do know about Christianity is that we bear no prejudice, and everybody is welcome. So you can take all that disgrace, Mr. Pence, and look yourself in the mirror and you'll find it right there." Of course, she has the story about Karen Pence's school completely wrong. It is simply holding to biblical and historic Christian standards, forbidding certain behaviors rather than certain people. 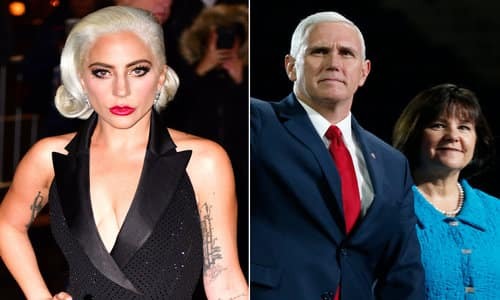 And, certainly, it's easy to point a finger at some of Lady Gaga's performances - especially some of her more infamous music videos - and say, "That's not exactly Christian." They are not associated with any scandalous behavior - financially or sexually - and it is commendable, rather than contemptible, that the wife of the Vice President has gone back to teach at a children's school. How common is that? From the viewpoint of the Pences - and hundreds of millions of Christians worldwide - it represents the extraordinary love of God, the indescribable compassion of the Savior, the matchless demonstration of the Lord's grace. It speaks of a perfectly holy God who has the right to destroy each and everyone of us. But instead, in the person of His Son, He comes into our world and - who could imagine this? - dies for our sins. That is what we call the gospel. In the famous words of John's Gospel (and perhaps spoken by Jesus Himself), "For God did not send His Son into the world to condemn the world but that the world through Him might be saved" (John 3:17). Or, in the words of the angel Gabriel in Matthew's Gospel, "You shall call His name Jesus, for He shall save His people from their sins" (Matthew 1:21). He not only reaches out to us, right where we are. He not only forgives us freely when we come to Him for mercy. But He sets us free from our sins. He changes us from the inside out - meaning, to the core of our being. You see, God's standards remain the same. Mike and Karen Pence are simply agreeing with God's standards while offering mercy and hope and forgiveness to all. Yes, all of us were born that way. Which is why Jesus taught, "You must be born again! You must be born from above!" I'm praying that one day, you would be able to sing, "Born a brand new way!" Isn't that what you want most of all?